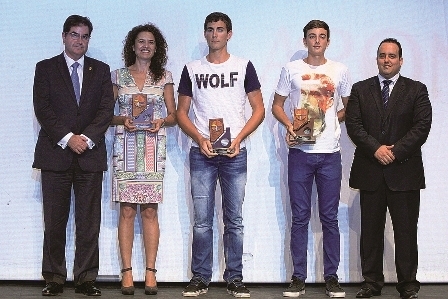 Local clubs and sportspersons were celebrated at the Arona Annual Sports Awards on November 22 at the Infanta Leonor Auditorium in Los Cristianos, for results and performances achieved during the 2013/14 season. 16.12.2014 - The glitzy event was attended by the mayor of Arona, the local sports councillor, various Canarian and national authorities, and friends and relatives of the nominees. It kicked off with a performance by Enigma, a local troupe who wowed the crowd with a breathtaking capoeira show, (a Brazilian martial art of African origin that combines dance, music and acrobatics). Later, the gala featured ‘Flash the Laser Show’, a stunning laser performance that captivated the eight hundred strong crowd. Humour was supplied by popular Canarian comedian, Aarón Gómez, who received a riotous reception throughout the entire act, culminating with a standing ovation that nearly delayed the awards ceremony! Councillors also had their say, laying out plans for future projects in the borough, including swimming courses for infants and pregnant women, and activities for senior members of the community. The event closed with a medley from the musical, Rock History, featuring dancers and musicians and incorporating favourite songs from the hit show; a fitting end to a special night for Arona’s athletes, young and old, winners and runner-ups. The 19th gala for sports saw beach volleyball players, Óscar Jiménez and Alejandro Huertas, awarded Best Male Athletes, while tennis player, Rachel Mota Dominguez, took the Best Female prize. Local hockey club, Tenerife Guanches, received the Best Club award, and judo team, Club Yogo, won the special prize for Gender Equality. An appropriate inclusion coming just before the International Day for the Elimination of Violence Against Women; a global event to promote gender equality. The International Sporting Award went to Ruth Beitia from Cantabria, the European high jump champion who has a long history in athletics and has represented Spain at international level. The future is looking very bright on Arona’s sporting horizon, and local clubs and sports enthusiast can take enormous pride.